Sarah Lisanby, director of the division of the National Institute of Mental Health (NIMH) opens the workshop (very interesting, great slides) after introductions at 0:14, Anna Wexler speaks at 2:25. Is a way to think about the effects of tDCS then, that it increases neuronal ‘excitability’? Interesting too, the possibility that AC stimulation might actually be affecting neurotransmitter production. …between 1938 and 1945, subsequently led to an interest in the application of AC at lower intensities with the first study of “cranial electro-therapy stimulation” (also known as “electrosleep”) published by Anan’ev and others in 1957… Since the 1960s, a series of studies with low-intensity AC stimulation have been published, and cranial AC stimulation devices have become commercially available for personal use (e.g., Alpha-Stim, Fisher Wallace Cranial Stimulator, Transair Stimulator, etc.). However, research in this area has been inconsistent and there remains a lack of solid evidence showing the effects of weak transcranial stimulation with AC. …During tDCS, low-amplitude direct currents penetrate the skull to enter the brain. Although there is substantial shunting of current at the scalp, sufficient current penetrates the brain to modify the transmembrane neuronal potential and, thus, influences the level of excitability and modulates the firing rate of individual neurons. DC currents do not induce action potentials; rather, the current appears to modulate the spontaneous neuronal activity in a polarity-dependent fashion: For example, anodal tDCS applied over the motor cortex increases the excitability of the underlying motor cortex, whereas cathodal tDCS applied over the same area decreases it. Similarly, anodal tDCS applied over the occipital cortex produces short-lasting increases in visual cortex excitability. Hence, tDCS is believed to deliver its effects by polarizing brain tissue, and although anodal stimulation generally increases excitability and cathodal stimulation generally reduces excitability, the direction of polarization depends strictly on the orientation of axons and dendrites in the indu- ced electrical field. 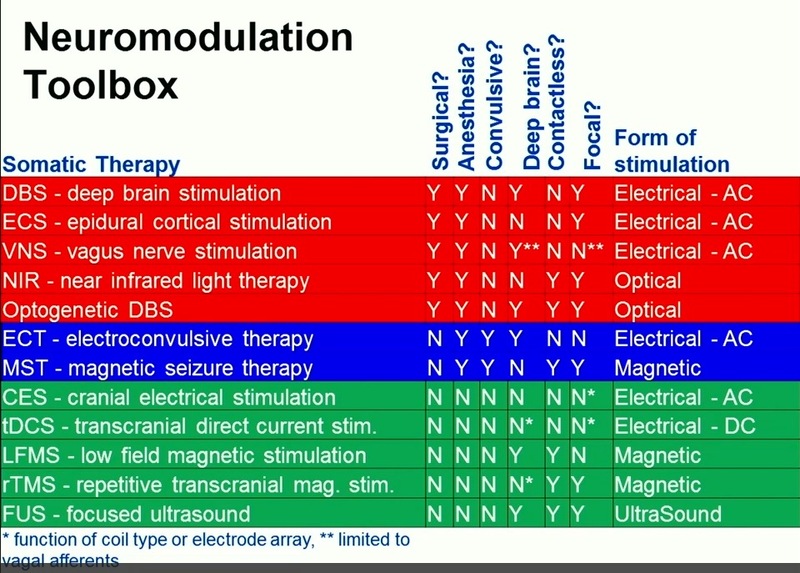 CES is a nonstandardized and often indistinct method of delivering cranial AC stimulation; indeed many studies cite the method of stimulation simply as “cranial electrotherapy stimulation” without identifying the specific site or other parameters of stimulation (e.g., duration, current density, intensity, electrode size) calling into question existing reviews of this method. Even so, CES has been suggested to be effective in the treatment of anxiety, depression, stress, and insomnia, and the following parameters of stimulation have been reported: frequency (0.5 Hz to 167 kHz), intensity (100 μA to 4 mA), and duration of stimulation (5 min to 6 consecutive days). … Biochemical changes—neurotransmitter and endorphin release. Several studies suggest that AC stimulation may be associated with changes in neurotransmitters and endorphin release. In this context, subthreshold stimulation induced by AC stimulation would indeed cause significant changes in the nervous system electrical activity. For further reading on CES (AC stimulation) the wikipedia page is quite good!